The Berkshire XLT is Forest River’s highly anticipated entrée into the all-electric appliance Class A luxury 450HP tag axle diesel pusher market. Complementing its list of ultra-premium amenities is a state-of-the-art Aqua-Hot 400D hydronic heating solution. The 400D allows owners to put heat where they want it, providing even, moist interior heat throughout the Berkshire XLT. Running quiet and fume-free on the RV's diesel supply or AC shore power, it also provides continuous, tankless hot water to the motorhome's baths and galley. 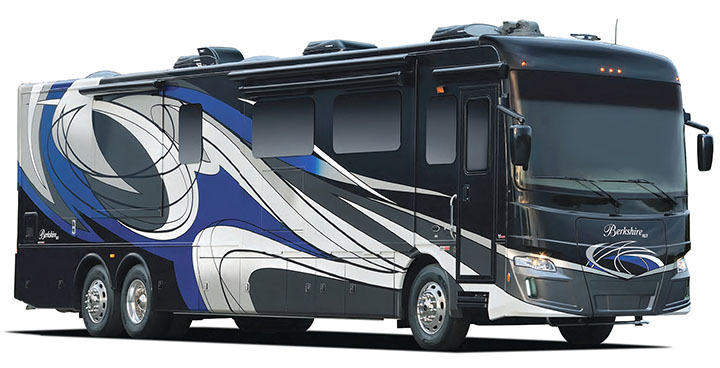 "Aqua-Hot is a staple within the luxury coach market," said Tim Cunningham, Forest River Diesel Motorhome national sales and product manager. "We designed the Berkshire XLT to incorporate premium features, while maintaining a price point that makes it exceptionally attractive." Powered by a 450 hp Cummins ISL Turbo engine tied to an Allison 6-speed transmission, the Forest River Berkshire XLT is built on Freightliner's V-Ride Rear RV Suspension System. Rated for a 24,000 lb. load, it easily accommodates the residential-style components and massive storage areas. Inside, the Berkshire XLT is pure opulence. Four floorplans offer thoughtful layouts with exceptional flow and spaciousness. Its artisanal craftsmanship and high-end components offer timeless styling and retained value. Its website is bit.ly/BerkshireXLT.